When it comes to digesting food, the human body is exquisitely designed for this task. Through a complex process, food is broken up, the necessary nutrients are absorbed, and the waste products are eliminated. From the moment that food enters the mouth, digestion begins. Food gets broken up, and moistened with saliva that also contains digestive enzymes. The food goes through the esophagus to the stomach where it is stored and mixed. It then passes into the small intestine where the majority of the nutrient absorption takes place. However, when a person who has celiac disease consumes gluten, a protein found in wheat, rye and barley, his or her immune system responds by attacking the small intestine and inhibiting the absorption of important nutrients into the body. Celiac disease is an autoimmune disorder that results in damage to the lining of the small intestine when foods with gluten are eaten. 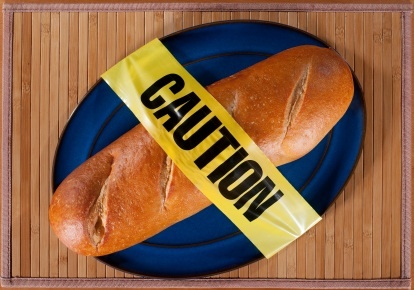 At least 2 million Americans have celiac disease, but most are not aware they suffer the problem, according to a report published in the American Journal of Gastroenterology, July 31, 2012. The only treatment for celiac disease is to follow a gluten-free diet, that is, to avoid all foods that contain wheat including spelt, triticale, and kamut, rye, and barley. For most people, following this diet will stop symptoms, heal existing intestinal damage, and prevent further damage. Sometimes, sadly enough, it’s not too difficult to tell when someone has been recently diagnosed as having celiac disease when they come into Oryana. They can be found wandering the aisles, looking confused and forlorn. Fortunately, we try to make it as easy as possible for them to find the right products. The shelf tags of our wheat-free items have a red sticker that says wheat-free on them. We offer a number of prepared food items made with wheat-free ingredients in our café. Just about any of the sandwiches we make can be prepared using wheat-free bread. We always offer at least one wheat-free soup on the soup bar. Many of our salads and hotbar entrees are also wheat-free. If you ever have any questions about any product at Oryana, please don’t hesitate to ask someone…we take great pride in our customer service and product knowledge. * Gluten products such as wheat flour are present in our kitchen and although we take great pains to minimize cross-contamination, we can’t guarantee that our prepared foods are 100% gluten-free. Recognizing obvious wheat products like breads, is easy. Because gluten is sometimes used as an additive in unexpected products—such as lipstick and play dough—reading product labels is important. The following list, which is by no means complete, offers possible sources of gluten, and will give you some idea of the extent to which gluten is used. Gluten is also used in some medications. People with celiac disease should ask a pharmacist if prescribed medications contain wheat. And if something is labeled “wheat free,” that doesn’t mean it is gluten free, so you will still need to read the list of ingredients. Despite these restrictions, people with celiac disease can eat a well-balanced diet with a variety of foods. They can use potato, rice, soy, amaranth, quinoa, millet, teff, sorghum, buckwheat, or bean flours instead of wheat flour. Specialty flours made from gluten-free foods like rice and corn, or “heritage” grains like sorghum and quinoa, must be coaxed into forming dough, which rarely bakes with the same texture as wheat flour. So a binding agent, like xanthan or guar gum, is added to give gluten-free baked goods the same elasticity and feel as those that contain gluten. Mix dry ingredients in a large bowl and then add wet ingredients. Mix together until it’s the consistency of cookie dough or moist play dough. You might need to add flour or milk (1 tablespoon at a time) until it’s right. It depends on humidity and the size of the eggs. You can refrigerate it at this point for up to an hour. For rolls – you want it a bit on the moist side. Spray cooking spray on your hands and shape into about 12 balls. (Or drop like drop biscuits.) Bake at 375 for 12-15 minutes. For pizza crust – add a touch of garlic powder (not garlic salt) and a teaspoon of Italian herbs to dough. You want it just a bit less moist than for rolls. You can either make it into one large pizza crust or 6-8 mini crusts. Put dough on cookie sheet sprayed with cooking spray. Spray a piece of plastic wrap and place on top of dough. Roll with a rolling pin to about 1/3 inch thick. (For mini pizzas you can just use your hands to pat down to the right shape and thickness.) Bake at 375 for 10-12 minutes, depending on size. Top with pizza toppings and bake until cheese is bubbly. Combine the flours, xanthan gum, salt, sugar and yeast in a large bowl and beat well using a wooden spoon. If using a stand-up or electric mixer use the paddle attachment. Add the olive oil and water and mix until incorporated. The dough will be more like cake batter than traditional bread dough. Bake at 400 degrees for 10 minutes. Remove loaf pans from oven and cover with aluminum foil. Return to oven and bake for an additional 35-45 minutes, depending on your oven. If you won’t be eating it within 2 days, after it’s cooled, slice it, wrap it in a couple of layers of plastic wrap, and freeze it. Never refrigerate this or other bread—it will get dry and hard if you do. If you leave the bread on the counter (wrapped), it will be good for all purposes for a couple of days. After that, it will be best used for bread pudding, French toast, croutons, etc.